What was South Africa's 'thin red line'? Features: Who were Ireland's first Wallace brothers? 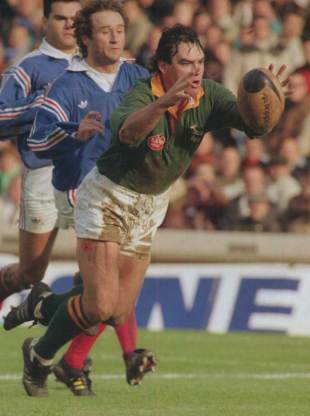 In this edition, John answers questions on French rugby in the 1930s, South Africa's 'thin red line' and other Springbok queries. The Four Home Unions had been unhappy about aspects of the game in France going back to before the Great War. The Scots refused to play France in 1914 after the referee was vociferously abused and physically threatened by the crowd after the 1913 match in Paris. In 1920 there were 169 clubs affiliated to the newly-formed French Rugby Union (the FFR), but the popularity of the French Club Championship boosted membership 400% by 1927 with the South and South-West becoming the heart of French rugby. Rumours spread of players switching clubs for job inducements. Shamateurism was rife, crowds unruly and referees often physically attacked. On the field, play was often brutal. On the night of the 1930 Championship semi-final the young Agen wing, Michel Pradié, died in hospital from injuries sustained in a violent tackle playing that afternoon against Pau. Matters came to a head in February 1931 when the Home Unions informed the FFR that matches between France and the Home Unions - at club and national level - would be suspended from the end of the season until it was "satisfied the control and conduct of the game [in France] has been placed on a satisfactory basis in all essentials." England still had to honour their Championship match in Paris on Easter Monday in 1931, two months after the notice of the suspension had been made. France beat them 14-13 in a pulsating match in which England took the lead three times. Carl Aarvold, the visiting captain, made a gracious after-match speech offering the hope that playing relations could be quickly resumed. But the loss of contact with the home countries sent the game in France into decline. The number of clubs affiliated to the FFR fell by nearly a half by 1939, while in 1934 the noted French flanker Jean Galia became the moving force behind the formation of France's equivalent to Rugby League - 'Rugby à treize'. He and three other members of the 1931 side that beat England - Robert Samatan, Léopold Servole & Ernest Camo - passed to the 'Treizistes'. 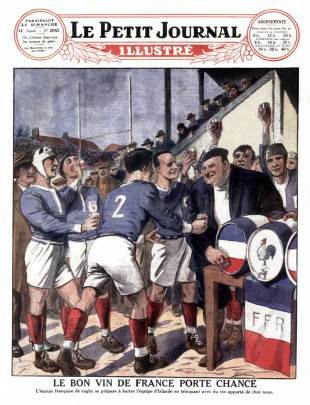 Eventually, in April 1939 the French clubs agreed to suspend their Championship and shortly after, the FFR was informed by the Home Unions that relations could be renewed with France scheduled to rejoin the International Championship from 1940. The thin red line was the name given to the Stellenbosch club three-quarter line which came together in 1905 and was rated one of the best attacking units ever seen in South African rugby. The club wore red-wine coloured jerseys, hence the nickname. The club's senior fifteens were unbeaten in 49 matches played that season. The only blots on their copybook were three drawn games in the Town Challenge competition.The three-quarter line comprised J A "Bob" Loubser and A C (Anton) Stegmann on the wings with H A "Boy" de Villiers and J D "Japie" Krige in the centre. Stegmann was usually in the second XV but was selected out of position in the pack to face the Villagers club in the final of the Grand Challenge tournament. Near the end of the game Lochner, a wing, was injured and Stegmann transferred from the pack to the vacant three-quarter position. He scored the winning try. In 1906 the Stellenbosch quartet were the stars of the Western Province side that carried off the Currie Cup in Johannesburg, a tournament that also doubled as the trials for the forthcoming South Africa tour to Europe. The strength of South African rugby in the early years of the 20th Century was its three-quarter play and the "thin red line" was selected en bloc for the tour made by the First Springboks to Britain, Ireland and France in the autumn/winter of 1906. The Stellenbosch unit went into the first Test of the tour against Scotland at Hampden Park in Glasgow. It was only the third club in the history of international rugby to provide an entire four-man three-quarter line in a Test. The value of the try was raised from four to five points in mid-1992. The last four-point try scored for South Africa was by centre Michael du Plessis in the second Test against a World Invitation XV at Ellis Park, Johannesburg in 1989. The match, arranged during the Springboks' isolation years, was part of the centenary celebrations of the South African Rugby Board. The try was scored five minutes from time after Kobus Burger had made a fine run along the wing. Good support work by skipper Jannie Breedt put Du Plessis in position to score. The try gave the 'Boks an unassailable 22-7 lead, but the World XV managed nine late consolation points to make the final score 22-16. Three years passed before South Africa returned from the international wilderness and their next Test was against the All Blacks on the same ground. New Zealand established a 10-0 half-time lead and led 20-3 before Danie Gerber scored the Springboks' first five-point try to bring the hosts back into the game. Pieter Müller (on debut) and Gerber added further five-pointers as South Africa fought back before finally losing 27-24. "Scrum, scrum, scrum," was the text of a famous cable sent to the Springboks at their Auckland hotel in 1937 while they prepared for the third and final Test of their series with the All Blacks. The inaugural 1921 rubber between rugby's superpowers had been shared 1-1 with one drawn in New Zealand and the 1928 series had finished 2-2 in South Africa. The Auckland Test of 1937 was the series decider and, in the eyes of many, a fight for the 'World Rugby Crown'. New Zealand had taken the opening Test 13-7 in Wellington before the 'Boks had won the second 13-6 in Christchurch. At the time, the Laws of the Game permitted the side restarting from touch to opt for a scrum ten yards in from touch instead of a lineout. The "scrum" message, which was sent by former Springbok captain Paul Roos, was to encourage the South Africans to exercise that option in order to offset the clear supremacy New Zealand had gained at lineouts earlier in the series. The Springboks scrummaged effectively. They won five successive strikes from the kick-off and went ahead through a try by Louis Babrow after only three minutes. Soon afterwards the first lineout was awarded to the Springboks. Philip Nel, their captain, surprised the crowd by choosing to scrummage. The All Blacks were again shoved off the ball and the visitors never looked back. The 'Boks continued to opt for scrums instead of their own lineout throws and went on to win the match 17-6 - five tries to nil. A recommendation to do away with the scrum alternative to a throw-in was made soon after the series. Owing to the outbreak of war the International Board could not meet until 1946, when the change was immediately confirmed.